"Sally (his wife) and I were brought to Texas 16 years ago to pull together a football program that was divided," Brown, 62, said in a statement. "With a lot of passion, hard work and determination from the kids, coaches and staff, we did that. We built a strong football family, reached great heights and accomplished a lot, and for that, I thank everyone. It’s been a wonderful ride. Now, the program is again being pulled in different directions, and I think the time is right for a change." Brown’s resignation comes in a season in which Texas suffered ugly losses to BYU and Mississippi early in the season, which led to the firing of defensive coordinator Manny Diaz. Despite several key injuries â including to starting quarterback David Ash â the Longhorns rebounded and were in position to win the outright Big 12 title heading into the season finale at Baylor. "We appreciate everything Mack has done for the University of Texas," new athletic director Steve Patterson said. "He’s been a tremendous coach, mentor, leader and ambassador for our university and our student-athletes. He is truly a college football legend. I’ve had a number of talks with him recently, and he has always said he wanted what was best for the University of Texas. I know this decision weighed heavily on him, and today he told us he’s ready to move forward." "This is a very difficult day for everyone in The University of Texas family," Powers said in a statement. 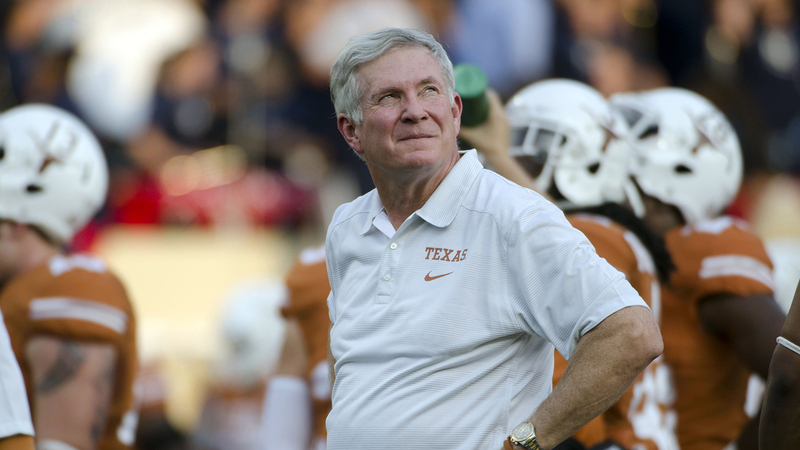 "Mack Brown is one of the best football coaches in the country, a tremendous representative of our university, and, most importantly, a great friend. He has produced championship teams with tremendous student-athletes and has always done so with the utmost class and integrity. Mack is just the best and he will be missed."